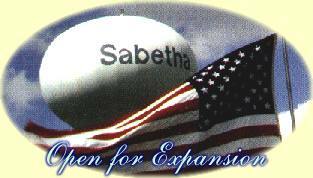 Our town has the unique distinction of being the only city with the name "Sabetha". The singular name comes from Sabetha's unique beginning. A young prospector who was a Greek Scholar and well versed in mythical lore as well as a student of the Bible, was traveling from St. Joseph, Missouri to California. The quest for gold was the reason for the journey. He had a team of oxen--one named Hercules and the other Pelleas. His trip was cut short one Sunday when Pelleas died near the site that is now Sabetha. Unable to continue his journey, the young man pitched a tent and dug a well. He named the well "Sabaton", the Greek word for Sabbath in honor of the day. The well was exceptionally fine, and became known to other pioneers traveling westward who would stop in order to quench their thirst. The first settlement on the land where Sabetha is currently located was made by Captain Arthur W. Williams in 1857-58. Sabetha became incorporated as a city during the summer of 1874. When Pelleas died in the 1850's, little did the prospector know what the future would hold for the final resting place of his faithful ox. Nemaha County has 14,723 acres of walk-in hunting. 2 miles north of Sabetha on 6th Street, Highway 75, 1/2 miles West, and 1/2 mile North. Three public parks, a public swimming pool, four baseball/softball/soccer fields, tennis and racketball courts provide recreation for the community. Two campgrounds with pools, cabins and camping facilities are located nearby. Pony Creek Lake has a surface area of 171 acres and a mean depth of 13.8 feet. It offers fishing, hiking, and hunting. Camping, is allowed in designated areas of the Park. Permit required. The Sabetha Library was built in the 1930s as one of the WPA projects.